The Lockout of 1913, the great strike that brought Dublin almost to a standstill in late 1913 and early 1914, is the first of a series of momentous events to be commemorated in Ireland’s forthcoming decade of centenaries. The 1913 strike, however, is in many ways an awkward guest at the table of commemoration. It was not caused by the question of Irish self government or independence. The labour conflict was not Irish nationalists against British imperialists. In some respects the Lockout also addresses unresolved questions in Irish society. ‘The National Question’ – about the independence and unity of Ireland – may in theory be unresolved with relation to the future status of Northern Ireland, but for most of the 26 county population, Irish independence is something that was achieved in the past. Notwithstanding the loss of Irish sovereignty caused by the 2008 financial crisis and the subsequent loss of fiscal independence to the International Monetary Fund and European Central Bank, the anniversaries of the Easter Rising , the War of Independence and even the Civil War will be about remembering the past and celebrating those who won ‘Irish Freedom’. Not so the Lockout. The dispute of 1913 was caused by the clash of the Irish Transport and General Workers’ Union ( ITGWU) founded by James Larkin in 1909 and the Dublin Employers’ Federation led by William Martin Murphy, owner of the Dublin United Tramway Company, the Irish Independent and several other newspapers. Larkin, influenced by the ideas of syndicalism, formed the ITGWU with the intention, not only of representing workers in one industry but general labourers in all industry and to enforce demands for better pay and conditions by means of sympathetic strikes across different firms. Murphy, reacting to Larkin’s militant methods, formed a cartel of employers who went about sacking ITGWU members and any worker who would not take an oath not join Larkin’s union. Larkin in retaliation called a strike on the Dublin United Tramway Company in late August 1913, in an effort to reinstate the sacked workers. In retaliation for that, Murphy had the Employers’ Federation sack or ‘lock out’, any worker who would not take the pledge never to associate with the ITGWU. Most union members, whether ITGWU members or not, refused to take the pledge and were sacked – up to 20,000 men and women in Dublin city and County lost their jobs by September 1913. There was now a straightforward fight between the two sides. Murphy’s tactic was to starve the strikers back to work and to bring in what employers called ‘free labour’ and trade unionists ‘scabs’ to do their work in the meantime. Larkin initially hoped to bring Murphy’s and others’ businesses to a standstill by picketing. This failed due to the violent dispersal of pickets by the Dublin Metropolitan Police (DMP) in the early weeks of the strike. The rioting left two strikers dead. Larkin’s fallback tactic was to tour Britain to try to rally British trade unionists into sympathetic action with Dublin. Though the British Trade Union Congress (TUC) gave generous financial support, they would not sanction sympathetic strikes. By the spring of 1914 the strike had petered out. Those workers who were accepted back drifted back to work after signing the humiliating pledge and generally had to accept lower pay than before. The ITGWU in short term was crushed. You can read in more detail about the course of the dispute elsewhere on the Irish Story (See here for starters). What this article will consider is some of the major areas of debate surrounding the Lockout. Was the Lockout caused by poverty and inequality? The short answer to this is yes, but not only by these factors. 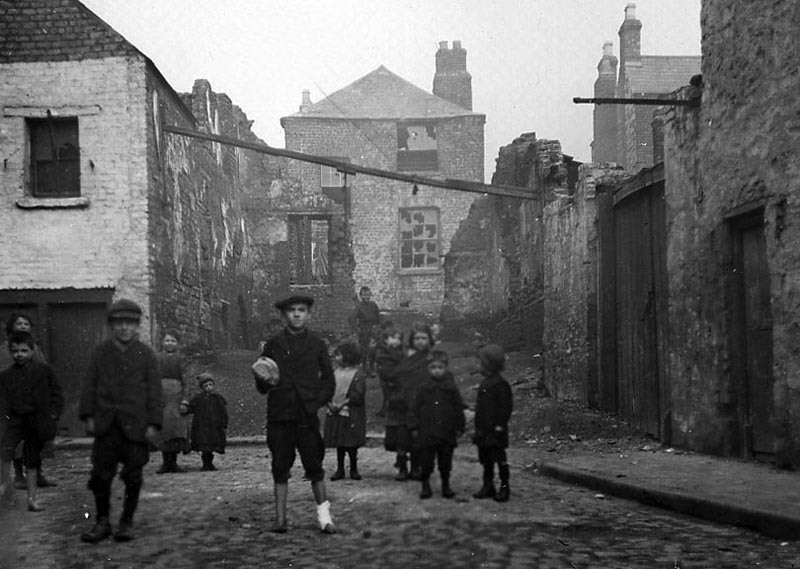 Dublin had 25,000 families (around 125,000 people) living in single rooms in the often decaying tenements. Its mortality rates were among the highest in Europe. Wages were low and unemployment was high. The poorest were generally unskilled and often casual workers, such as those at the city docks. So Larkin and his fellow union organisers had a large pool of disadvantaged and discontented men among whom they could build the Transport Union. The Lockout was not simply, as is sometimes maintained, a clash between two belligerent personalities in Larkin and Murphy. Proof of this is that the Dublin dispute was not an isolated case, but the largest in a series of bitter disputes around the country over union recognition. Cork had its own ‘lockout’ in 1909 as did Wexford in 1911, and Sligo in 1913. In 1911 Ireland was temporarily brought to a halt with a a strike on the Great Southern and Western Railway line. So 1913 was part of a larger pattern of disputes between the employing and labouring classes. The bitter strikes of the early 20th century, including the Dublin Lockout, were about more than economic demands. However, these disputes were not only economic. They were also about something more intangible, which contemporaries called ‘honour’. This was the question of whether an employer had to negotiate with his workers at all and whether he could sack them if they joined a union of their choice. They wanted to be treated, in the language of the day, ‘like men’. Did the Lockout begin the Irish Revolution? Here, the answer is certainly no. The Lockout was tangential to the developing storm over whether Home Rule for Ireland would be passed in the face of unionist opposition in Ulster. It occurred at the same time but the two had little to do with each other. Larkin and the other union leaders supported Home Rule (at least until more independence could be achieved) while Murphy was a former Home Rule MP. However, there is an argument to be made that the Lockout played a role in radicalising some republican activists. 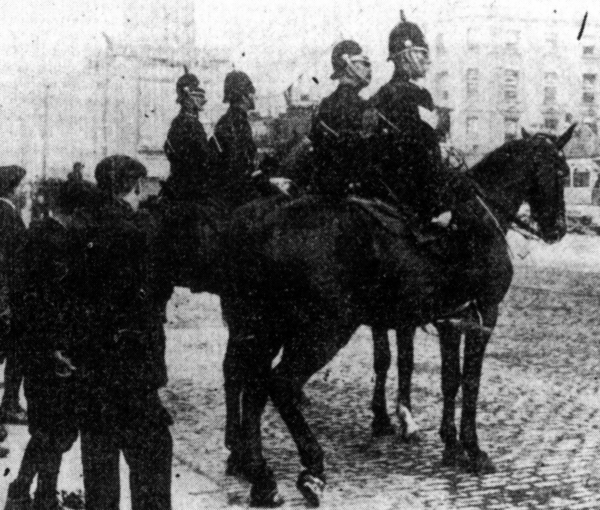 Police and troops answerable to Dublin Castle were used to disperse pickets and to protect strike breakers. The Lockout did not begin the nationalist revolution in Ireland but it may have radicalised some activists to use force against the state. Irish Freedom, organ of the Irish Republican Brotherhood, used the violence of the DMP against strikers to argue that British rule in Ireland was inherently coercive. For example reporting on the violence of the first weekend of the strike; ‘A labour meeting on O’Connell Street was the occasion of a display of brute force, the killing of two citizens and the wounding of 600’. The police who they termed, ‘the Irish Cossacks… the limbs of an invading power… a low type of renegade Irishman’, were playing, ‘the old game all over again. The raison d’être of Dublin Castle is to keep us in submission…You cannot punish the police brutes with empty hands, arm yourselves with bullets’. James Connolly (the union leader who led the Dublin strikers for most of the dispute while Larkin was in Britain) of course used the Irish Citizen Army, the union militia formed to defend pickets from the police in 1913, in the Easter Rising of 1916 – a nationalist insurrection against British rule. And there is evidence that some of his men thought that 1916 was, in part, paying back what the state had done to them in 1913. Connolly apparently told his men to ‘Remember how they treated you in 1913’. One former striker (in fact a member of the Irish Volunteers rather than the Citizen Army in 1916) justified shooting an unarmed policeman because, ‘I was unarmed in 1913’. In the subsequent struggle for independence the ITGWU and Irish Trade Union Congress played a key role, calling two general strikes, one against conscription in 1918 and another for the release of hunger strikers in 1920. But in the dispute of 1913 itself, it was the Dublin employers who were driving intransigence, not the British government, which urged mediation on both sides. Were Larkin and Connolly communists? 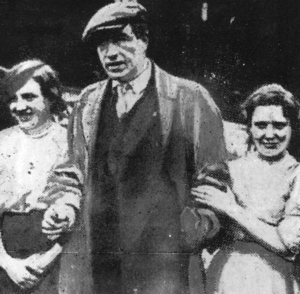 At the time what Murphy’s press and much of Dublin middle class opinion thought was that James Larkin, James Connolly and other union leaders were dangerous revolutionary socialists who wished to create, ‘a monopoly of labour’, to ruin employers with unreasonable wage demands and eventually to pull down capitalism itself. Murphy argued that he had no problem with ‘responsible’ unionism, simply with ‘Larkinism’. To an extent, all of this is true. Larkin and Connolly were revolutionary socialists, who envisaged One Big Union, representing all workers which would one day form the basis of a new society, ‘the cooperative commonwealth’. Connolly died at the hands of British firing squad in 1916, but Larkin did welcome the Bolshevik revolution in Russia and for some years afterwards did affiliate himself with the Communist International or Comintern. These organisations, which produced a human catastrophe in the USSR in the 1930s and a swathe of dictatorships across Europe after 1945 are justifiably unpopular today. However, while true, this is largely irrelevant to what happened in 1913. Larkin built his union not on the basis of ideology but on the basis that he could, by militant methods win better pay and conditions for his members. The ITGWU was a fighting union and clearly this was a message that many workers wanted to hear at the time. The overthrow of capitalism was never on the agenda during the Lockout, the question at hand was the survival of the ITGWU and the workers’ right to organise. What relevance does the Lockout have to Ireland today? 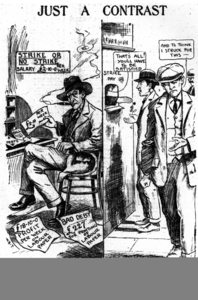 A cartoon portrays Larkin as the real exploiter. This brings us to a final and most fundamental question; did union membership protect and serve the interests of poor workers? The standard answer of those of a labour tradition, and the answer which became the mainstream over much of the 20th century was, ‘of course’. They argued that the only way to bring wages and conditions of workers up was through collective action. Critics of the ‘anarchy’ of capitalism can point to the world banking crisis of 2008 onwards to show what unregulated pursuit of profits can produce. However, a more recent orthodoxy in Ireland echoes that argued by the employers in 1913. Murphy’s press argued that militant unions and strikes ruined ‘commerce’ and in the long term harmed the workers themselves. More profits eventually meant more prosperity for the working class as well as for the employers. They argued that it was Larkin and the union leaders who were really exploiting the workers. This line of thinking has been fashionable again in Ireland since the 1990s, echoing the worldwide ideological shift back towards classical liberal economic theory, which argues that restrictions on economic activity not set by supply and demand impede economic activity and in the long term harm the prosperity of all. Companies such as the successful airline Ryanair have refused to negotiate with unions, as do many multinational companies that locate in Ireland, notably Intel. Union membership has dropped from 60% of workers in the 1980s to around 30% today. Newspapers such as the Sunday Independent routinely argue that union leaders such as SIPTU’s Jack O’Connor are overpaid ‘fat cats’ presiding over uneconomic privileges for workers, paid for by the tax payer. Union recognition ‘costs jobs’. These questions are far from settled in the 21st century. Both the doctrines of social solidarity and of the primacy of economic growth deserve to be taken seriously. However if there is one historical lesson to be taken from the lockout it is not necessarily one of economic theory but of republican democracy; that all citizens are inherently equal in rights. The Lockout of 1913 was above all a struggle for personal self determination, the right to determine one’s own future and not to be dictated to by the wealthy and powerful. Observers of revolution in the Arab world since 2011 have similarly consistently pointed not to ‘objective’ factors such as poverty as causal factors for revolt but to violations of ‘dignity’ – the feeling that those in power do not respect the ruled as equal human beings. If there is a present day lesson of the 1913 Lockout then this, the need for equality of respect in society, is surely it. Written by: John_Dorney on 27 August, 2013.on 10 September, 2013. 4 Responses to "Remembering the Lockout"
Hello, I am not sure how to use this site so probably leaving this request in the wrong place. I am currently trying to find an image of Captain Jack White for an exhibition. Would any visitors to this site know whom I should contact.